The 12 Inch Minnie Mouse bike is an ideal early learning bike. The bike can grow with your child’s ability as it features removable stabilisers plus a colourful patterned frame for extra fun. 12 inch (30cm) bike with removable stabilisers. Front and rear calliper brakes. Minnie Bow on front stem. Fully enclosed printed chain guard to protect little fingers. This toy costs approximately £69.99 (for the latest and best prices make sure you check our retailer list for the 12 inch Minnie Mouse Bike above). 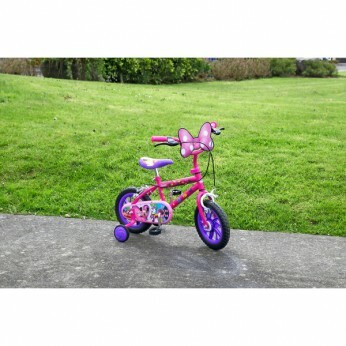 In our review of 12 inch Minnie Mouse Bike we classed it as being suitable for ages 3 years, 4 years, 5 years but recommend you check the manufacturer specific advice before purchasing.